During Easter, it is common sight to be given easter eggs. However, it is more common to see the kulich, or Easter bread, a type of sweet Russian bread topped with icing sugar and colourful candies. The kulich, or Easter bread. Note the 'ХВ' marking on top. In many European countries, there are various traditions surrounding the use of bread during the Easter holiday. Kulich (Russian for 'Easter cake') is a kind of Easter bread, traditional in the Orthodox Christian faith – Russia, Belarus, Bulgaria, Serbia, Ukraine etc. Kulich sold at the confectionary. Traditionally during the Easter service, the kulich, which has been put into a basket and decorated with colourful flowers, is blessed by the priest. Leftover kulich that isn't blessed is eaten with Paskha (Russian for 'Easter') for dessert. Blessed kulich is eaten before breakfast each day. 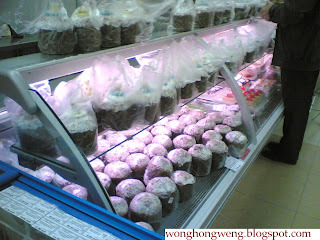 Kulich sold at the supermarket. It is baked in tall, cylindrical tins, and when cooled is decorated with white icing (which is slightly drizzled down the sides), colourful flowers, and the Cyrillic alphabets ХВ (Khristos Vaskresye greeting, Russian for 'Christ is Risen') is decorated on the side. 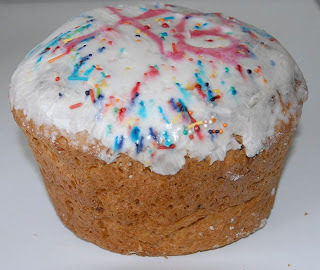 Kulich is only eaten during the 40 days after Paskha until Pentecost. One of the many varieties of kulich toppings. 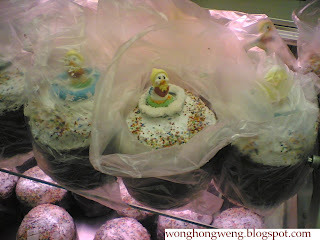 Many food stores and confectionaries sold this particular bread on this day. 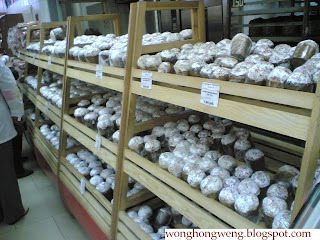 Kulich of varying sizes, shapes and colours as well as decorations replaced the common breads on their shelves. 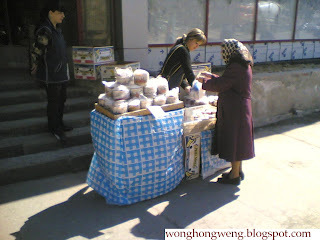 Kulich sold by the roadside. I got my own kulich today. I must say, it was one of the best tasting bread I've ever tried in Russia. It's interior was soft and filled with sweet raisins. A humble bread but highly appetising.